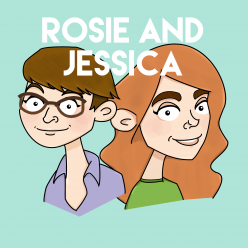 In episode 85, Rosie and Jessica find time to record despite Rosie’s busy forty-five minutes of work remaining. Jessica’s been having nice teas all over the place and they catch up on all the highlights of the Olympics. Bake Off Chat makes its triumphant seasonal return and new takes on old songs are enjoyed in Top 5 Cover Versions. No one mentions Suicide Squad and all is well. Jessica picked Happy Together by The Turtles, while Rosie went for Siri, Open Tinder by Childbirth. A playlist of (most of) the songs in our Top 5 Cover Versions is on Spotify! Relive Jessica’s time at Cropredy with the Pierce Brothers and some crudites. We could not love this new podcast from our friend Grace more if we tried! Please join our reciprocal appreciation festival with the wonderful Tangerine Menagerie.